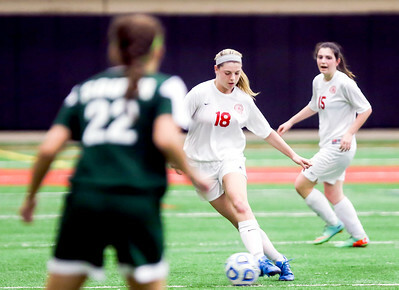 Sarah Nader- snader@shawmedia.com Marian Central's Alyssa Sutherland dribbles towards the goal during the first half of Wednesday's game against Crystal Lake South at Canlan Sportsplex in Lake Barringron April 5, 2016. 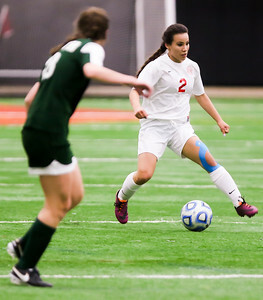 South defeated Marian Central, 1-0. 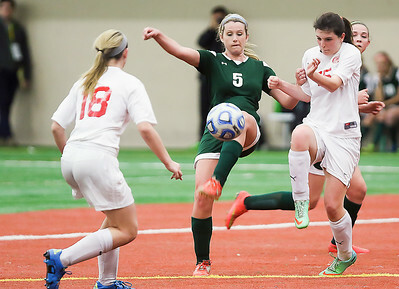 Sarah Nader- snader@shawmedia.com Crystal Lake South's Brandie Minogue (center) stops the ball during the first half of Wednesday's game against Marian Central at Canlan Sportsplex in Lake Barringron April 5, 2016. South defeated Marian Central, 1-0. 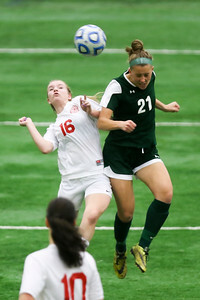 Sarah Nader- snader@shawmedia.com Marian Central's Lucca Kenyon (left) tries to take the ball from Crystal Lake South's Jessica Schoenfeldt while she has control during the first half of Wednesday's game at Canlan Sportsplex in Lake Barringron April 5, 2016. 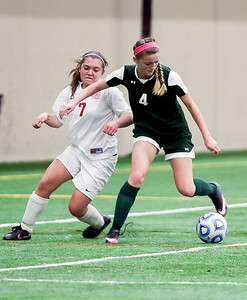 South defeated Marian Central, 1-0. 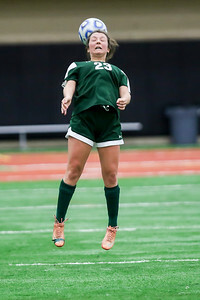 Sarah Nader- snader@shawmedia.com Crystal Lake South's Samantha Sisto heads the ball during the second half of Wednesday's game against Marian Central at Canlan Sportsplex in Lake Barringron April 5, 2016. South defeated Marian Central, 1-0. Sarah Nader- snader@shawmedia.com Marian Central's Amy Herff (left) and Crystal Lake South's Kelly Gaede head the ball during the second half of Wednesday's game at Canlan Sportsplex in Lake Barringron April 5, 2016. South defeated Marian Central, 1-0. 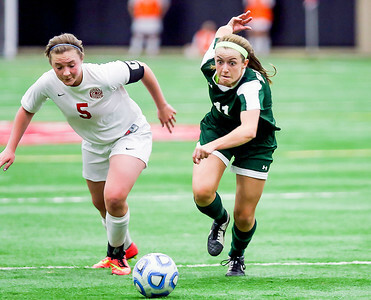 Sarah Nader- snader@shawmedia.com Marian Central's Erika Dacanay dribbles down filed during the first half of Wednesday's game against Crystal Lake South at Canlan Sportsplex in Lake Barringron April 5, 2016. South defeated Marian Central, 1-0. 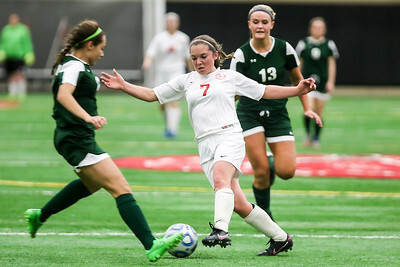 Sarah Nader- snader@shawmedia.com Marian Central's Lucca Kenyon (center) dribbles down field during the first half of Wednesday's game against Crystal Lake South at Canlan Sportsplex in Lake Barringron April 5, 2016. South defeated Marian Central, 1-0. 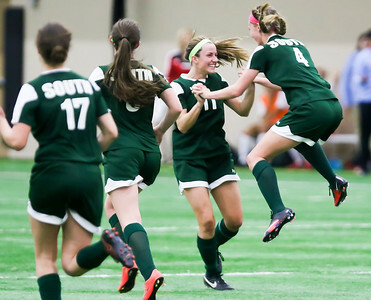 Sarah Nader- snader@shawmedia.com Crystal Lake South's Jenna Ross (left) celebrates with Jessica Schoenfeldt after she scored a goal during the second half of Wednesday's game at Canlan Sportsplex in Lake Barringron April 5, 2016. South defeated Marian Central, 1-0. Sarah Nader- snader@shawmedia.com Marian Central's Makala Villont (left) and Crystal Lake South's Jenna Ross run after a loose ball during the second half of Wednesday's game at Canlan Sportsplex in Lake Barringron April 5, 2016. South defeated Marian Central, 1-0. Marian Central's Makala Villont (left) and Crystal Lake South's Jenna Ross run after a loose ball during the second half of Wednesday's game at Canlan Sportsplex in Lake Barringron April 5, 2016. South defeated Marian Central, 1-0.